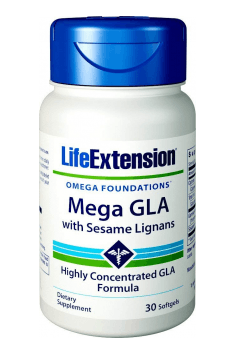 A dietary supplement Life Extension Mega GLA is a natural Borago seed extract, which provides gamma-linolenic acid (GLA). This plant is known all around the world for its medicinal properties. Additional ingredients are lignans which are derived from sesame seeds and complement the GLA action. The supplement contains natural vegetable oils, which are a source of essential fatty acids (EFA). EFA are compounds which are not produced by the body system and thus they need to be provided with food. Especially the diet of Europeans is poor in natural vegetable oils and thus a lot of them suffer from the deficiencies of valuable EFA. Gamma-linolenic acid (GLA) is an important fatty acid which plays a major role in the production of prostaglandin (PGE1) and the inhibition of the proinflammatory mediators synthesis. By blocking this path, GLA reduces the formation of pro-inflammatory factors – prostaglandins E2 and leukotrienes B4. Fatty acids are necessary for the proper functioning of the body system. Some of them, although produced by the body system, are not synthesized in large enough quantities, thus, they have to be provided in the diet. They are therefore considered as essential fatty acids (EFA). Gamma-linolenic acid (GLA) is an organic chemical compound which belongs to the omega 6 fatty acids. It is a precursor to prostaglandin PGE1 – a hormonally active derivative of arachidonic acid which has numerous biological functions. It is present in the GLA supplement and shows anti-inflammatory and bactericidal properties. Moreover, it shows mild sedative and mind relaxing properties. When used by people who work mentally and physically, it will give them energy. It is recommended for menopausal women as it can reduce unpleasant symptoms of menopause, mainly bad mood and mood irregularities. GLA can also improve blood circulation and endocrine glands functions. Borage oil extract, thanks to its positive influence on blood circulation in the skin, removes the toxins, improves the appearance and the colour of skin as well as makes skin tissue better oxygenated and nourished. It is used internally to treat inflammations and damages of mucous membranes, including damages of the digestive system mainly in the mouth, esophagus, stomach and intestines. It positively influences the respiratory system functions. It has diuretic properties and thus, for many years, has been used in the treatment of chronic kidney disease. It has also proven to be effective in people with rheumatic problems. The important property of Borage oil extract is its ability to regulate the transepidermal water loss (TEWL). This ability is related to the presence of sticky substances in the plant, such as alpha-hydroxy acids. Lignans (sesame seeds oil) are compounds derived from sesame lignin. This phytoestrogens are recommended for people with problems of too high levels of bad LDL cholesterol and hypertension. In a study published in 2006 in “Journal of Foods”, it was demonstrated that sesame oil lowers blood pressure and glucose levels in hypertension associated with diabetes especially type II. During this research, sesame oil protected animals from the development of a disease called multiple sclerosis (SM) by reducing the secretion of interferon gamma (IFNγ) – a key factor in initiating autoimmune inflammation and injury of the nervous system. It has been also found that sesame oil may play a potentially beneficial role in the treatment of other neurodegenerative diseases, for example Huntington's disease. Moreover, sesame seeds contain a very strong antioxidant, which has anti-atherosclerotic properties. Sesame oil contains an oil-soluble form of lignin. Sesamin, a substance that has been analysed in view of the inhibiting cancer cells proliferation. Sesame lignans are very efficient in fighting free radicals. Moreover, they have a health promoting influence on the digestive system. Furthermore, they are recommended in the treatment of haemorrhoids and constipations. Life Extension Mega GLA is a great dietary supplement designed for health-conscious people. It contains GLA extracted from Borage oil and lignin of sesame seeds, which helps to maintain the proper level of fatty acids which have a health promoting influence on the whole body system. Numerous studies document a lot of beneficial health effects thanks to the use of additional sources of GLA. Take 1 capsule 1-2 times a day during a meal. In order to ensure best results, simply use 1 capsule once a day. The largest effects are noticeable after 6 weeks of regular use. Gelatin, glycerin, silica, purified water, carob. Dosage: the proportions of the ratio between Omega 3 and Omega 6 in the ratio of 1: 1 to 1: 5 enables flexible dosing. Sesame seed extract - demonstrates wide pro-health properties due to the richness of biologically active ingredients contained in sesame seeds. They constitute a perfect source of B-group vitamins, vitamin A and E, provide folic acid and contain a range of minerals. Apart from this, they constitute a perfect source of dietary fiber, facilitating peristalsis. As for the amino acid profile of sesame, tryptophan may be distinguished, an amino acid promoting proper synthesis of melatonin. Sesame seed extract is commonly used in the prophylaxis of cardiovascular system diseases. It is attributed positive influence on blood coagulation and it may also optimize lipid profile. According to some sources, it is conducive to maintaining low blood pressure values. The compounds contained in sesame seeds are also attributed antioxidant effect, due to which it allows to fight with the excess of harmful free radicals in the organism. This is probably the reason for anticarcinogenic properties of sesame, reported by some people.